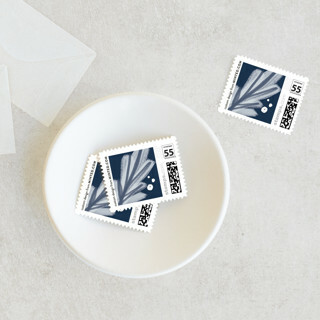 Elevate any envelope with Minted’s postage stamps. Our custom stamps are recognized by the U.S. Postal service and can be used for mail originating in the United States. Choose from an array of designs from our community of independent artists to reflect your personal style. • 71¢ for square envelopes, odd-shaped or rigid mailings, or mailings up to 2 ounces. Please check your post office to confirm the postage required for your mailing. At this time, custom stamps cannot be shipped to international addresses. Please note that you will not receive a digital proof of your holiday stamps order. Real designers creating your cards. 100% Satisfaction guaranteed. Our designers review your order. They will make sure there are no typos, problems with your photo, and will make sure your requests are included in the design. One of our professional designers will adjust everything to make sure your card looks great. Once your proof is done, a digital copy will be emailed to you for approval. If your card isn’t perfect or you want any revisions to your proof, let us know. Once you are happy with your proof, you send us your approval via email or phone and your order is sent to the printer. We will never send an order to print without approval.